Creating meaningful, timely, and relevant content around your brand will keep your visitors and fans engaged. Of course, content creation can be a time consuming activity so supplementing your own content with real time curated content is a valuable tool. This type of widget is quite common and becoming more and more popular among major brands. 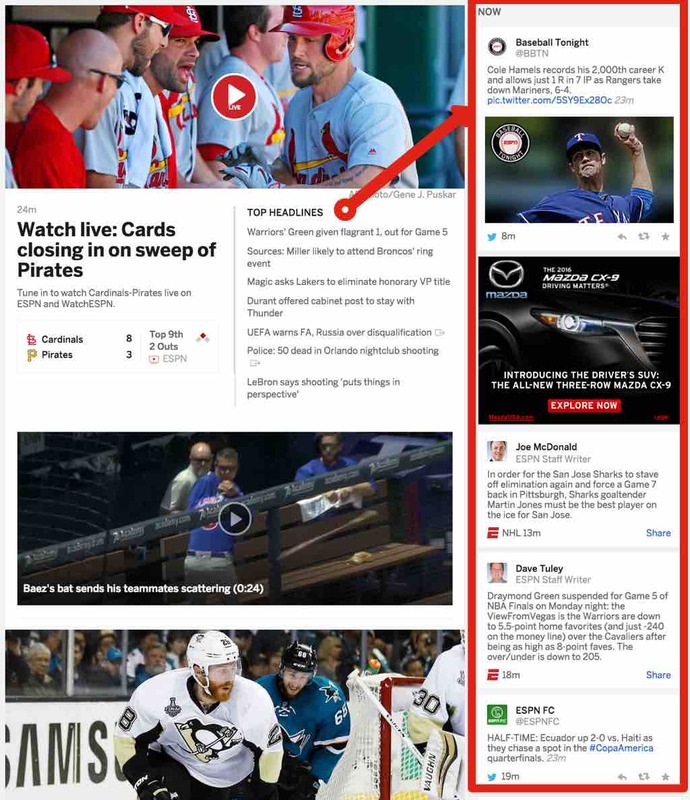 For example, ESPN's most recent website redesign added a "Now" column on the right hand side of their site that is a curated list of content from their own reporters, as well as social content from around the Web. It's an extremely sticky form of news reporting as it provides quick and timely snippets of information as it happens, and the ability to dive in deeper by clicking on the post. Personally, it's one of the first things I glance at when visiting the ESPN site, and one of the things that actually keeps me going back on a daily basis since I know relevant content will be continually streamed there. Furthermore, I can count on ESPN's human curation to surface only the best, most relevant content around a sport or team. To achieve such a site, you can easily use Spotlyte's social filters to continually crawl and update social content around your brand or story. The moderation tools enables you to pick, choose, and highlight the content to be displayed to your public viewers. Up until recently, adding this type of content to your social display or Spotlyte widget used to be a tedious process. However, with the addition of our newly updated Custom Post feature, sharing any type of ad-hoc content is a breeze. 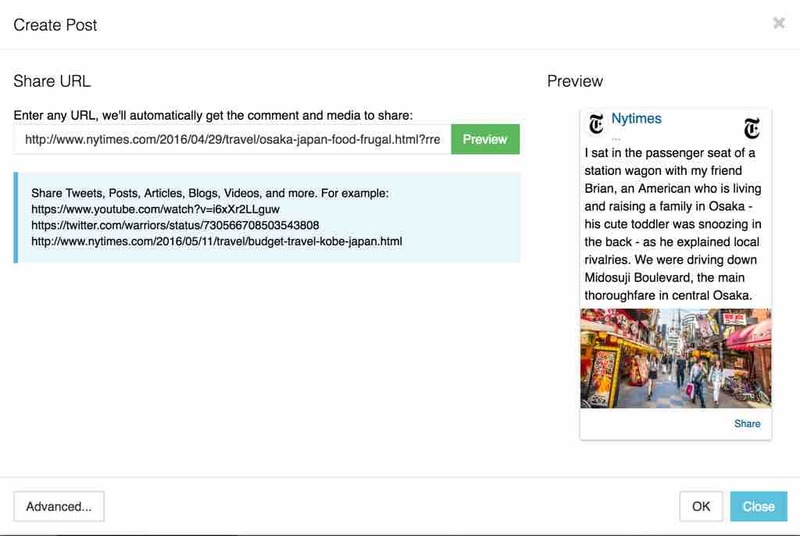 In fact, paste any URL into the Custom Post editor and we'll pull all the relevant images, videos, authors, links, and content to share. That's it. Find content. Copy & Paste URL. Share content. The ability to add these types of custom content to your social wall enables you to merge social and web content with your own created content. Your social wall becomes an even more central part of your content and branding strategy. An instant preview of the URL is created, giving you a quick look at what will be added to your social wall. If what we extracted from the URL looks correct, click OK and see your post will immediately be added to your social wall where you'll be able to highlight and feature it using a proper theme in the Display Editor. On the other hand, if we couldn't pull the relevant content or there are edits you'd like to make to what was automatically extracted, you have access to the Advanced panel which enables you to change the Text, Link, Image of the post to your liking. The Advanced panel can be extremely useful for customizing any content you want to share. Also you might have an image, message, or sponsored message you'd like to share with your audience, this can be done from the Advanced panel as well. 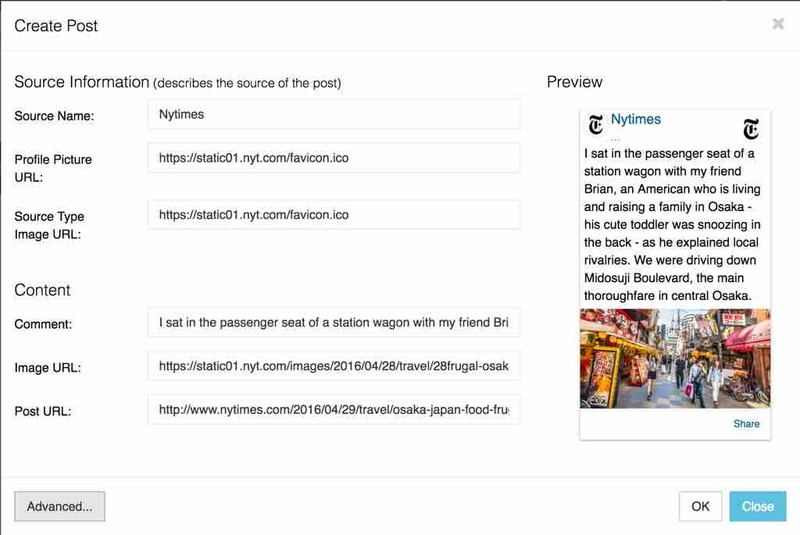 Curating content has never been easier with Spotlyte. Combining the power of our social crawler and the flexibility of the Custom Post Quick Share, will provide you endless opportunities to discover and share the best content with your audience. Engage your audience with relevant content, and keep them coming back for daily updates.